Pattern by Stitched by Crystal. Working on some new designs! Emily got her Elsa doll so I thought I'd better make something for Oliver. 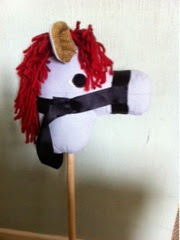 He loves Emily's hobby horse, and had seen one like it in a shop recently so I decided to make him a hobby horse. The internet is full of tutorials so I grabbed some fabric and started cutting. 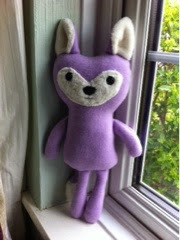 It's a little wonky but pretty cool, I think! Oliver was pretty chuffed when I gave it to him this morning. About 10 minutes later he told me Emily's store-bought one is better. Emily is obsessed with 'Frozen' at the moment. 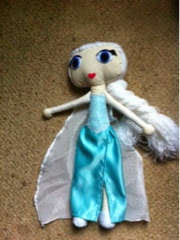 So I decided to make a version of Elsa using my large rag doll pattern. She went to bed quite happy! 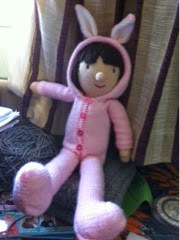 I've been working on a new variation for the 'Sandrine' doll I designed. I'm trying out some new hair styles. 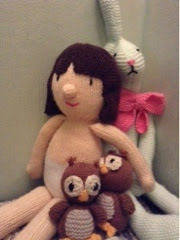 I'm taking a short break though to knit something for my brother for his 30th. It's on April 10th so I need to get knitting!